And I only asked why Jews can’t live next to Palestinians on the West Bank…. And so to my final blog of 2014 and a public event I attended last month at the University of Westminster, London. 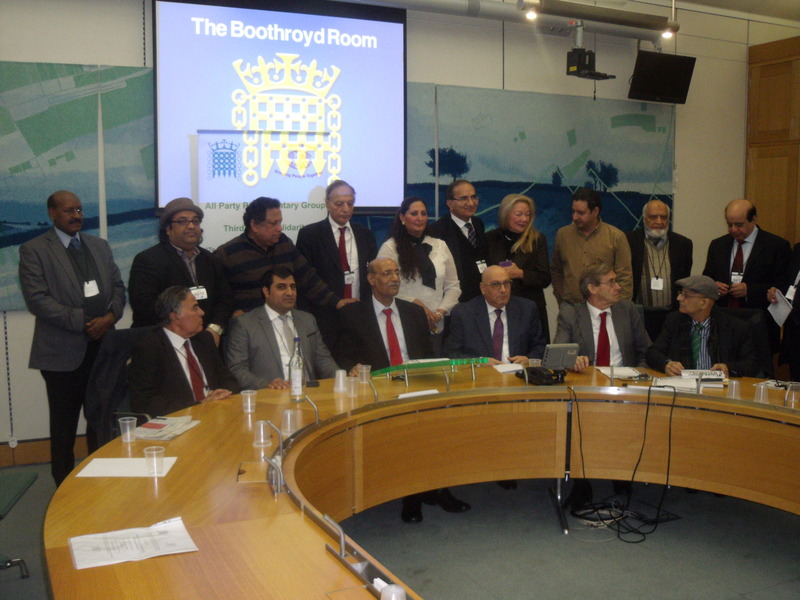 On 13th November 2014 a panel discussed Parliament Recognises Palestine: What Next? 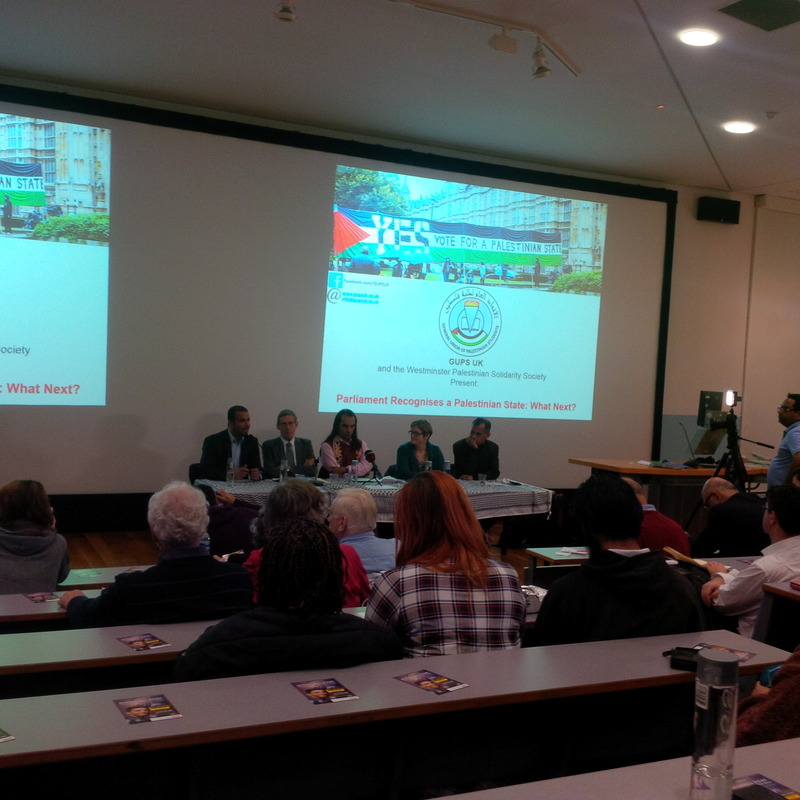 The panel consisted of Sara Apps, Campaigns Officer for the Palestine Solidarity Campaign, Martin “tentacles” Linton, chair of Labour Friends of Palestine, Murad Qureshi, a Labour Party Member of the London Mayoral Assembly and, finally, a representative from the General Union of Palestinian Students (GUPS – UK). The panel was chaired by Dr. Dibyesh Anand, Head of Department of Politics and International Relations at the University of Westminster. The head of Fatah in the UK then described how the Palestinians had welcomed the Jews from Nazi Germany and protected the Jewish community in Beirut during Lebanon’s civil war. Martin Linton then accused me of dangerously introducing “Jewish” into the discussion. But he then praised the anti-Israel group Jewish Voices for Peace (JVP). Sarah Apps said she abhored anti-Semitism. However, her organisation’s logo dispenses with Israel altogether. So, if implicitly calling for the eradication of the Jewish state isn’t anti-Semitism then, one must ask, what is? Anand Dibyesh said this event wasn’t at all anti-Semitic (I never claimed it was) before immediately, himself, going on to make a link between Nazism and Israel. Finally, a student asked what she could do to help. Martin Linton responded that she should support Karen Buck, the Labour MP for Westminster North, who, he said, is very pro-Palestinian. It seems for some the needs of the Palestinians are more important than the needs of the good people of Westminster North. On the way out I was encircled by some aggressive students who told me I was brainwashed and who asked repeatedly how much I was being paid. So here’s to a less hypocritical and more constructive 2015 although with the May general election on the horizon many British politicians will be using the Palestinians as mere political fodder with which to try to secure their own re-election. Thank you for all the supportive comments I have had throughout 2014. Thank you to those who have commented on my blog and those who have cross-posted me and many thanks for the support of the team at CIFWatch. More importantly a huge “thank you” to those who continue to fight against anti-Semitism and Israel’s delegitimisation in the UK but who receive little, if any, credit in return. A healthy and happy New Year to everyone. How I confronted Palestinian “ambassador” over the Har Nof killings. On Tuesday night in Parliament I asked Manuel Hassassian, the unofficial Palestinian ambassador to the UK, why in the speech he had just delivered in which he accused Israel of “war crimes” he made no mention of Palestinian violence, specifically the recent murders by two Palestinians of four Rabbis and a Druze policeman at a west Jerusalem synagogue. Meanwhile, a woman had just told the room that the Palestinians were suffering a fate worse than that of Anne Frank. What she said was bad enough but the most chilling aspect was the warm applause she received from both Hassassian and ex-Labour MP Martin Linton, now chairperson of Labour Friends of Palestine, as well as from the others present. The actual event at Parliament was about that recent vote to recognise a Palestinian state at some time in the future. Although it was held under the auspices of the All Party Parliamentary Group on Third World Solidarity it was for all intents and purposes another sickening Labour Party anti-Israel event. As well as Linton current Labour MP Khalid Mahmood spoke. Labour MP Richard Burden and Labour’s Lord Ahmed were also due to speak but were both absent. Mahmood replied to my question on the role of Hamas in the conflict by accusing Israel of bombing the Palestinian Authority out of Gaza so leaving the road clear for a Hamas takeover. Finally there was Linton, now notorious for invoking anti-Jewish Nazi imagery when he once referred to “the tentacles of Israel” interfering in Britain’s political system. Remarkably there were only 25 people present at the event with swathes of empty seats. Those present finally convened for a group photo, see below, and with numbers short I offered to help out with taking photos for those who wanted a memento of the sour night. Group photo! Linton front 2nd from right, Hassassian front 3rd from right.